AK-CHIN INDIAN COMMUNITY –The Ak-Chin Indian Community and Sundt-Yates, a joint venture between Sundt Construction, Inc. (www.sundt.com) and Yates Construction, recently broke ground on a multi-million dollar expansion at Harrah’s Ak-Chin Casino in the Ak-Chin Indian Community near Maricopa, Ariz. Designed by TBE Architects, the expansion will include a spa, a conference center with multi-use ballroom space, a parking garage, additional restaurants and more than 200 guest rooms. 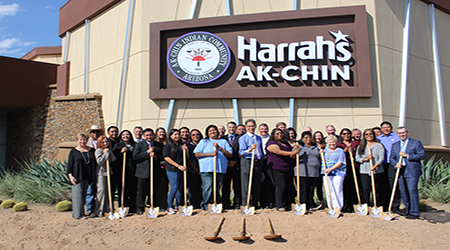 “The Ak-Chin Indian Community is excited about this expansion that will provide our guests and visitors with the high-quality hospitality and entertainment that they have come to expect at Harrah’s Ak-Chin Casino,” said Ak-Chin Indian Community Chairman Robert Miguel. 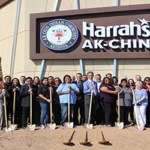 According to Robert Livingston, general manager of Harrah’s Ak-Chin Casino, this expansion will not only increase room availability and accommodate additional hotel guests, but will also afford the property the opportunity to host large-scale entertainment, conventions and other meetings. 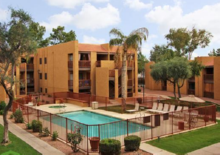 “As one of a few full-service hotels and casinos in the area, this expansion will offer more options to visitors and guests throughout the Pinal and Maricopa counties,” said Livingston. For more information regarding the Ak-Chin Indian Community and future updates regarding the expansion, visit www.ak-chin.nsn.us.